Such world-scale catastrophes as the Ukrainian Holodomor of 1932-33 will never be perceived by society as a theoretical academic issue, a problem of purely scholarly importance. The tragedy of the terror by famine is above all our persistent and enduring pain. But because this terrible catastrophe has been used, whether we like it or not, as an exceptionally devastating weapon in the contemporary political struggle, it is our historians’ moral duty to study the causes and as yet unknown consequences of this Apocalypse, constantly search for new evidence and proof of its genocidal character, and investigate its impact on the consciousness of various generations, in particular contemporary youth. This is what Dr. Stanislav KULCHYTSKY, one of Ukraine’s leading authorities on the history of Soviet totalitarian society in the 1920s-1930s and a regular contributor to The Day , discusses in his latest article. The authors’ carefully crafted formulations reveal their deep knowledge of original sources. One cannot disagree with every cited statement, including the main thesis: the famine in the USSR was unexpected and undesirable for the party leaders. I met Davies and Wheatcroft at numerous conferences and set up a book exchange with them. They sent me the book that I quoted above, marking the places where they talk about the great volume of food that the Soviet government sent to the Ukrainian republic and the Kuban region in the first half of 1933. What kind of genocide can we talk about in the light of these data? It is very difficult to convince the representatives of the Birmingham school, the most authoritative one in the West, to investigate the national aspect of the 1932-33 famine in the USSR, but it is this very aspect that can reveal the fact of the Ukrainian Holodomor. Conquest’s statement is a departure from the position he declared in 1986. His original stance was based on the testimonies of the survivors of the 1932-33 famine in rural areas. Now, under pressure from revisionists, he withdraws his statements from the Cold War period. In other words, he continues to maintain that Stalin was guilty of causing people to die, but he refuses to qualify Stalin’s actions as homicide, opting instead for something similar to manslaughter, as defined in criminal law. This unexpected revision of our understanding that Stalin pursued a constant policy of preventive terror was brought about by the end of the Cold War. If one subscribes to Conquest’s statement, the foundation for qualifying the famine as genocide disappears. Ukrainian historians are faced with the difficult task of convincing their foreign colleagues of the correctness of our interpretation. In order for the evidential basis of the Holodomor as genocide to pass an international review, it needs to be developed very seriously. The main stumbling block is, of course, the question: whom did Stalin destroy — ethnic Ukrainians or citizens of Ukraine? At first glance, the question is meaningless because the same people died. But a convincing answer to this question will determine whether the world will recognize the Holodomor as genocide. 5. WHOM DID STALIN DESTROY? In October 2005 I took part in an international scholarly seminar organized by the Gramsci Institute in Rome. The topic “Stalin, the Soviet Famine of 1931-33, and the Ukrainian Holodomor” was suggested by Professor Andrea Graziosi of the University of Naples, a prolific researcher of Soviet history. The Italian participants at the seminar explained that in 2003 the UN did not recognize the Holodomor as genocide because the Ukrainian side did not submit evidence showing that it was Ukrainians whom the Soviet regime destroyed. The submitted documents proved that in 1932-33 millions of people died in Ukraine, which was a known fact. This observation prompted me to initiate a series of articles entitled “Why Did Stalin Destroy Us?” (The Day, Oct. 25, 2005). Whereas foreigners politely request evidence demonstrating that Stalin’s regime destroyed ethnic Ukrainians, the majority of Ukrainian citizens hold a radically different view. In 2006 the Kyiv International Institute of Sociology, part of Kyiv-Mohyla Academy, conducted a survey on the Holodomor among adult Ukrainians. A four-tiered approach was adopted and interesting results were obtained. The first question was: “Have you heard or read about the 1932-33 Holodomor in Ukraine?” Most respondents (94.4 percent) answered in the affirmative. Then they were asked: “Was this famine caused mainly by the actions of the government or by natural factors?” A majority (69 percent) attributed the famine to the government’s actions, 12.1 to natural factors, 5.4 had not thought about this question, and 13.5 refused to answer. The first group was then asked a third question: “Did the famine target all citizens of Ukraine irrespective of their ethnic origin or only ethnic Ukrainians?” The distribution of answers was as follows: 60.8 percent thought it was aimed against all citizens of Ukraine, 26.2 against ethnic Ukrainians, 11.2 refused to answer, and 1.8 had not thought about it. Among respondents of the first group, 40.8 percent lived in the western oblasts, 20.8 in the central regions, 16.4 in the south, and 22.7 in the east. The results are so telling that there is no need to comment on them. Journalists and scholars should be complimented for showing that today’s generation already understands the criminal nature of the actions committed by Stalin’s regime. On the contrary, those people who were starving to death did not see the big picture. Even high-ranking party officials failed to see it. We should not doubt the sincerity (in this case) of Nikita Khrushchev’s memories. He was second secretary of the Moscow city and oblast committees of the Communist Party and knew about the raging famine in Ukraine, but he did not understand the causes. The poll showed that in every region the majority of respondents did not perceive the Holodomor as ethnic genocide. Even in the western oblasts, which in 1933 were not part of the USSR, half of the respondents maintained that it targeted all citizens of Ukraine regardless of their ethnic origin. A sociological survey tells us what average citizens believe. No less interesting for me is to analyze what our intellectual elite thinks. I will limit myself to an excerpt from an article by Leonid Shvets, a talented journalist who works for Gazeta Po-Kievski. The article was published on the day the Verkhovna Rada was scheduled to vote on the Holodomor bill, so the author could not have known the results. Shvets adduced three arguments that apparently contradicted the perception of the Holodomor as genocide. “For many people in Russia and Ukraine it has proved difficult to perceive the Holodomor as a conscious policy aimed at destroying the population of Ukraine based on ethnic origin, i.e., the much-discussed genocide. First, this kind of legal qualification was given to crimes associated with an openly declared and demonstratively conducted government policy of destroying national, ethnic, racial, and religious groups. In the case of the Holodomor, however, the facts of mass deaths were concealed from the rest of the country and the outside world. In the mass media of the time you will not find any hint of an anti-Ukrainian attitude, not to mention Ukrainophobic hysteria similar to Goebbels’s Judeophobic propaganda. The Bolsheviks sucked the life out of the Ukrainian village using the terminology of the class struggle. This quotation is too long, but it represents in condensed form the line of reasoning pursued by opponents of the Holodomor-as-genocide concept. The arguments presented above appear to be logical, but only because we do not know our own history. To be more precise, we do not know its “hidden” strata and instead follow literal interpretations of Soviet terminology, even though it often meant something completely different. Shvets justly claims that the population of Ukraine was not persecuted on the basis of ethnic origin (to him only this would mean genocide) and the Soviet Union did not exhibit Ukrainophobic hysteria. He is also correct in saying that the USSR did not pursue a destructive policy against ethnic Ukrainians. But he acknowledges the existence of the struggle against the so-called “nationalistic tendency” and persecutions of intellectuals and party members. How can these statements be reconciled if they seem to contradict each other? Shvets will not give us an answer, but one does exist. Let us first examine the behavior of Pavel Postyshev, who arrived in Kharkiv in late January 1933, i.e., immediately after the food expropriation campaign in rural areas came to an end. Postyshev was appointed second secretary of the Central Committee of the Communist Party (Bolshevik) of Ukraine and was formally subordinate to the Central Committee’s General Secretary Stanislav Kosior. However, Postyshev simultaneously retained his position as secretary of the USSR’s Central Committee and was in direct and constant contact with the Kremlin. An analysis of Postyshev’s activities helps answer the question: against whom was Stalin fighting in Ukraine? The Kremlin’s enemies were Ukrainians as bearers of Ukrainian statehood rather than Ukrainians as an ethnos. The Ukrainian state frightened the Communist Party leaders even in its Soviet shell. It was only after the Holodomor and its inseparable component — mass persecutions of the Ukrainian intelligentsia — that the Kremlin stopped fearing Ukraine. In 1934 Ukraine’s capital was moved back to Kyiv on Postyshev’s initiative. The essence of the policy of Ukrainization remains a mystery to Shvets. Before unveiling it, we need to remember who the most active Ukrainizer was. It was not Skrypnyk, who was only a People’s Commissar, but Lazar Kaganovich, Secretary General of the CC CP(B)U. Ukrainization was a version of indigenization, i.e., enrooting Soviet power in the non-Russian republics. The policy of Ukrainization did foster a national renaissance. But we also need to recognize that one of the consequences of enrooting Soviet power was the participation of poor Ukrainian peasants in food confiscations in rural areas in January 1933. Stalin was anything but paranoid. He was supported by the communist Oleksandr Holub, who openly acknowledged that passing the president’s bill would “lead to tensions in Ukraine’s relations with Russia.” So the Party of Regions and the Communist Party rejected the president’s bill, mindful of another country’s position on this issue. Compared to their coalition allies, the socialists adopted a different stance: they insisted on paraphrasing the phrase “genocide of the Ukrainian nation” as “genocide of the Ukrainian people.” Socialist MP Vasyl Tsushko said that he is a Moldovan and both of his grandfathers died in the Holodomor, and that the socialist faction would support the bill only with this amendment. Moldovans indeed suffered even greater losses than Ukrainians. (We are talking here about the Moldovan Autonomous Republic within the Ukrainian SSR; Bessarabia was then under Romania.) Compared to the 1926 census, the 1937 census data showed that the Moldovan population in the USSR fell to 80.3 percent, whereas the population of Ukraine dropped to 84.7 percent. After President Yushchenko gave his consent, the bill was amended, put to the vote, and passed as a law of Ukraine. The amendment proposed by the socialists is of a purely factual nature and should be welcomed. In 1933 registry offices in rural areas of Ukraine logged 1,678,000 deaths. The distribution by ethnic origin was as follows: 1,552,000 Ukrainians, 85,000 Russians, 27,000 Jews, 21,000 Poles, 16,000 Moldovans, 13,000 Germans, 8,000 Bulgarians, 3,000 Greeks, and so on. Of course, these statistics are incomplete and include cases of natural death, and thus fail to represent the scale of the Holodomor. But the distribution by ethnic origin roughly matched the ethnic composition of the Ukrainian peasantry. This is evidence of the common fate that befell the people living in rural areas of the Ukrainian Soviet Socialist Republic. The mechanisms of terror by famine that were used by the government confirm this tendency. In January 1933, i.e., during Stalin’s campaign for an all-out food expropriation, travel from the Ukrainian republic and the Kuban region of the North-Caucasus Territory to other regions was strictly controlled. Starting from April 1933, when the commercial trade in break — without the use of ration cards — developed in Ukrainian cities, authorities took measures to blockade villages. The authors of the presidential bill deemed it more appropriate to use the notion “Ukrainian nation” in order to come as close as possible to the definitions contained in the UN Convention on the Prevention and Punishment of the Crime of Genocide. The Convention lists only four groups of people-ethnic, national, racial, and religious. To them, the term “people” appeared to fall outside the scope of these groups. In fact, this is not true. In my opinion, the importance of a common territory in the definition of “people” only facilitates the identification of the Holodomor as genocide. It would be absurd to believe that Stalin persecuted Ukrainians wherever he could find them. By insisting on the formulation that Ukrainians were destroyed as representatives of an undesirable nationality, we run the risk of ruining the entire evidential basis for the case of genocide. Moreover, we will encounter — we already have — fierce opposition on the part of Russians, both in Ukraine and in the Russian Federation. An ethnically-motivated contrast between Ukrainians and Russians in the Holodomor case automatically shifts the responsibility from a narrow circle of Kremlin criminals to the state and people of Russia. How can Russian people agree with this if a large part — unfortunately, perhaps even the majority — of them identify Ukrainians as Russians and do not in the least perceive Ukrainians as representatives of a separate people? I am not overstating or exaggerating this thesis — that’s how it really is. In this connection, it is worthwhile mentioning an argument raised by Professor Valerii Khmelko, who heads the Kyiv International Institute of Sociology. 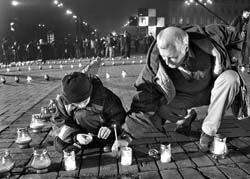 In the Nov. 24, 2006 issues of the newspaper Ekonomicheskie Izvestiia he commented on the results of a sociological survey, which were presented at the beginning of this section: “It is beyond doubt that this was a mass destruction of people. But the claim about the destruction of Ukrainians based on their ethnic origin has to be proved, and an ethic group or groups that destroyed Ukrainians have to be named.” Unfortunately, there are quite a few marginal politicians who readily point the finger at those they dislike — Russians or Jews. Russia and Israel listen to these kinds of statements and sometimes, in pursuit of their own goals, even raise the political weight of these politicians from zero to something significant. The latter are, of course, pleased. The esteemed professor, my colleague at Kyiv-Mohyla Academy, is faced with the fact that Stalin destroyed precisely Ukrainian peasants. Just like the majority of the respondents in that survey, he cannot believe, for good reason, that it was Ukrainians who were destroyed. Following the rules of formal logic, he is left to believe that Stalin destroyed peasants.